This is an example of how to run a query similar to GROUP BY from the SQL world, but in MongoDB. MongoDB doesn't have GROUP BY, but it has a very similar group command. In my example I want to return the number of songs per artist, therefore I'm grouping by artist name. This example is from my MongoDB + Scala + Gradle + Morphia app. It turns out that Morphia does not help with that at the moment, so we have to run the query raw and then process the results. And here's how to process results. 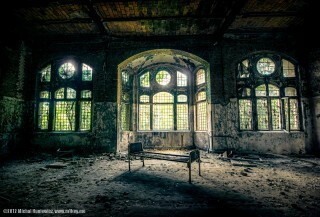 Hi, these pictures are from Beelitz-Heilstätten, the abandoned sanatorium in Germany, where Adolf Hitler once was a patient. Hi, here's how to create a unique compound index with Morphia and Scala. The example is from my Gradle + Scala + MongoDb application Also, here's Part 1 of my tutorial on building a Scala + Gradle + Guice applications. Also, my final note here is this: If you make any such changes to your MongoDb schema, you have to drop the collection from the Mongo client.